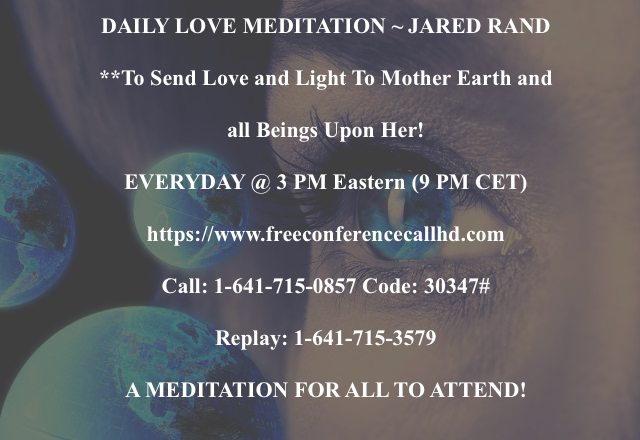 After the welcome, Jared Rand states: “As far as our meditation today, I think that it would be a good direction to send peace, security, peace-prosperity, love, tenderness, kindness, caring, compassion.All these words balled up into one energy wave that we can create….. As far as planet Earth, in our immediate solar system. Calmis another word that comes to mind, calming those on planet Earth. Feeling the energy. I know some of you feel it every day, most of us feel it every day. The different occurrences that are taking place, the rapidity and the rapidness, I should say.How rapid things are the increasing frequency of happenings across the planet, different land occurrences… the waterways disappearing, fish beaching themselves, birds from the sky. People want to know what’s going on and what’s taking place in occurrences that are taking place. These are part of the fringe areas of the earth-changes that are taking place that no one has seen in over 10,000 years, that we are now experiencing. Some of us have been here, for those times and that’s why some of us feel familiar. We are in an “advanced stage of evolution.” The Human Race, The Planet Earth… our solar system, this part of the galaxy is in an advanced stage of evolution and we are all changing at a rapid pace. I know that some you can feel it. You don’t discuss outwardly but we are. We are changing. All of us are and it’s for the better. It’s good, it’s a good change, it’s not a negative change and to calm and add peace and love and prosperity, and kindness and compassion… to all of humanity in this meditation. the waters, the soil and to add this unending love, prosperity, peace, abundance, joy. Great wealth. I mean just happy, fulfilling, progressive, massive, major changes…. with that energy. And we can just picture it and see it is saturating everywhere. Nothing can be protected from it. It is an endless, loving rain. It will penetrate everything, everywhere, every place and in addition to that because of the “Golden-White-Pink Light sphere”, that we created several weeks ago. We…. Once we start these meditations, they are connected and interlinked, so there are constantly operating in the sphereupon the planet. So that we were reinforcing and adding the power and the strength of Prime –Source-Creator-God. Each time we do a meditation, it gives it another shot in the arm. So we continually increase, the basically the unending love-power, the compassion-power, the wealth, the abundance, the prosperity, the happiness, the joy. It all keeps increasing at a rapid pace and we keep strengthening it, with these daily meditations and that’s why I said in the beginning of these meditations. It is a lifelong commitment for humanity. Humanity in the future will meditate every day.It will be just a regular occurrence, every day. So there won’t be any “once in a while” “once a month” “once every other day” It will be every day. The human race will gladly participate in it and want to be a part of it. Right now, we are pioneering it, to the extent where everybody we can find, to join. Everywhere! We’ve got people sitting in rooms with one line, bringing 500 people in. We ’ve got people that are setting up hall’s, meeting halls where they can come every day and get on the line, on the speaker line and listen in on the meditation and participate. There are many ways that this can be done without everybody having to call in. You could have one person with 500, one with 2000, one with 3000. Across the plane… from everywhere …and that’s the direction that we are working towards so that the increase … We’re like 50 some? Away from 8000 call participantsand a lot of those are coming in with groups of people and listening from different parts of the planet and participating in the meditations. Once again, I remind you that this is not a complete transcription. I’m merely trying to help raise the world’s vibration, by sharing information about this Mass Meditation process. Many blessings to you all…. May all of your dreams come true! Notes by Juli Joy of The Young Lightworkers. *The Guided Global Meditation will start on Everyday @ 3pm EST & continue on a DAILY basis at the same time.